The Thief watches you and follows your movements, but his motivations are simple and easily explainable. He is, after all, a thief. He wants your money, whatever you have, whatever you can get, all of it. It's the way he goes about it that feels unsettling. After he leaves, you will be something far worse than broke: you will be broken. You will be confused. You will feel violated. Without money you are still human. Without memories, without direction, and without motivation you will cease to exist. The Thief exits your life with a pile of cash but at least he is gone forever. The parasite he leaves behind robs you of so much more. You aren't alone though. This has happened before. Of course it has. You weren't the first victim of The Thief and you certainly won't be the last. Someone out there knows exactly what you are going through in a sense, but they are just as lost and hurt and empty as you. They can't truly comprehend your plight on a surface level that can be quantified with words, but they know. They just know. There is a connection there, a bond. You see it in their eyes and they see it in yours. You meet and the physical attraction is instant and obvious, but it is far deeper and more meaningful than lust. The pain you share is profound. The love you share is even more so. The Sampler watches you and follows your movements, but his motivations are far more complex and hard to understand. He may not take something from you in a literal sense, but his ambitions feel far more sinister and bizarre. He means to control you and your mind long after the parasite has been removed. His hypnotic and haunting tones reverberate through your soul, making it impossible to move on from the initial trauma. The Sampler robs you of your free will. The Sampler may not actually be God, but he loves to play one. Director Shane Carruth has captured cinematic magic here with Upstream Color, his second work after his debut Primer was released nine years earlier. He has created something confounding and challenging and deep and fascinating, the type of picture that is so aesthetically gorgeous and thematically rich it feels as if you are peeling back new layers of untapped brilliance with each viewing. Trust me, one won't be enough. There is a coherent narrative of sorts here but it is nearly impossible to follow the first time through. Hell, I will be completely honest, this is my third journey through Upstream Color and I still don't have all the answers. I'm not entirely sure I want them all. I want to keep coming back for more. I want to keep searching. I want to fall in love not with Kris (Amy Seimetz) or with Jeff (Shane Carruth) but with Kris and Jeff. With what they share. With their measured performances and subtle yet strong chemistry on screen. 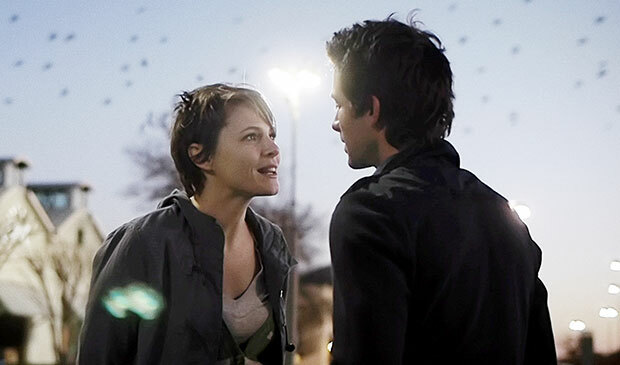 Upstream Color is an enigmatic, beautiful masterpiece and I want to keep putting the pieces together. I want to keep searching. Yeah, I've watched UPSTREAM COLOR three times now and I haven't figured it out but that's okay. I watched PRIMER three times and I couldn't explain it to you if you put a loaded gun to my head and demanded a synopsis of it outta me. But I enjoyed watching it greatly and I enjoyed UPSTREAM COLOR. yep, no shame in not understanding Derrick. There are films I have seen literally 10 times that I still can't fully comprehend. That's the beauty of art, you can form your own interpretations over time. "I'm not entirely sure I want them all." When I read this line I laughed out loud and clapped my hands together. I can relate to this sentiment so much. I feel I've pieced together enough to understand the themes, but I also feel there's so much more to be mined here and I'm looking forward to future viewings (I watched it for the first time earlier today). Thanks for the enjoyable review! Thanks Chad! I appreciate the very kind words and I am glad you can relate. I have talked to people who claim to fully understand films after one viewing and I find that kinda sad, to be honest. I get so excited to revisit a movie and see if I can piece anything else together, to take notice of dialogue I might have missed initially. Again, thanks for reading and commenting, appreciate it so much!